Sincera 4, the model for 4 bottles, is recommended for productions over 3000 bottles per year. 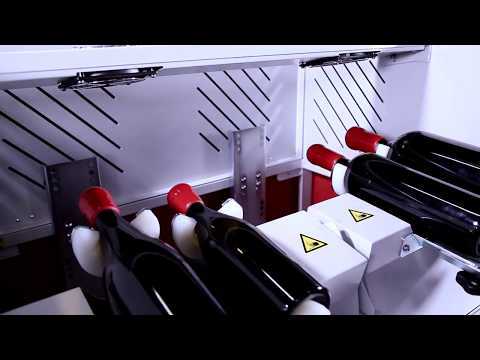 The standard version allows you to seal bottles from a minimum size of 0,75 lt to a maximum of 5 lt, with just one machine. The temperature, the immersion and the cooling times can be personalised via a simple operator control panel, thus guaranteeing optimal results. Bottle range: from 0,75 lt. to 5 lt.
Sincera 1, the device model for 1 bottle, is recommended for productions from few hundreds to 2000/3000 bottles per year. Sincera 2, the model for 2 bottles, is recommended for productions from 2000 up to 5000 bottles per year. Sincera XL, the model for big bottles, allows you to work bottles ranging from a minimum size of 3 lt. up to 27 lt.
Dry heater for sealing wax. Perfect for waxing bottles by hand.